The rainbow Pak comes with 24 8″ Wikki Stix one-of-a-kind creatable in the colors of the rainbow! Creative fun for all ages! 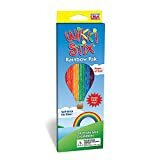 If you are new to Wikki Stix, they are simply made of knitting yarn and food-grade wax. Non-toxic, They do not contain gluten, latex, nor Peanut or other nut oils or by-products. They are endlessly reusable, will not break or tear apart but cut easily with scissors. Wikki Stix conform to all consumer safety regulations and are widely used as a teaching tool in schools. They are excellent for learning letters and numbers. And they can be pressed together for 3-D creativity too! With Wikki Stix, there is no right or wrong way to play! Proudly made in America!.